Who else is excited for the latest Super Hero movie, Spiderman Homecoming? Although I doubt my children will watch it with us, they are too little, I wanted to share the Super Hero excitement with them. My son just had a Batman party and loves to pretend he's fighting bad guys. They were climbing the walls with excitement as they watched me make these! 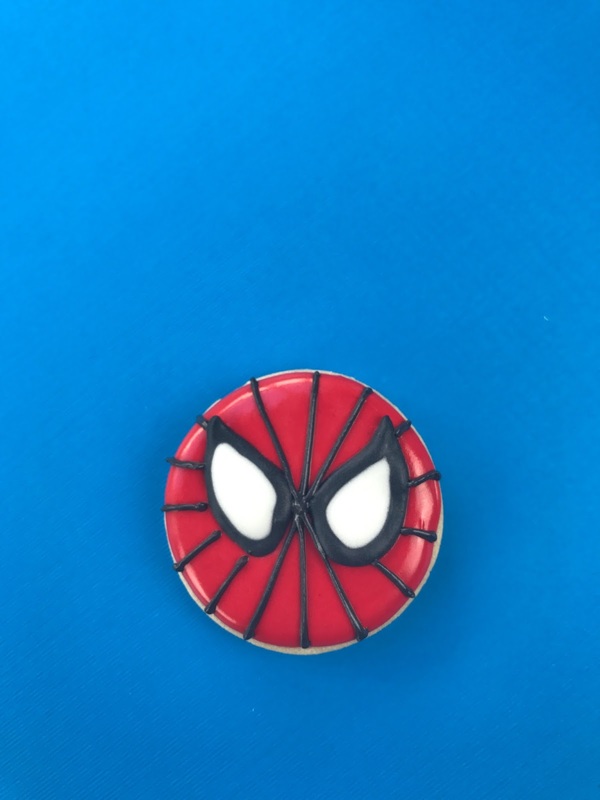 These Spiderman cookies are really pretty quick! I used a royal icing transfer for the eyes and that makes this whole cookie a low stress design. These are small enough to be used as an adorable cupcake topper or you can make them large round cookies for a party favor. 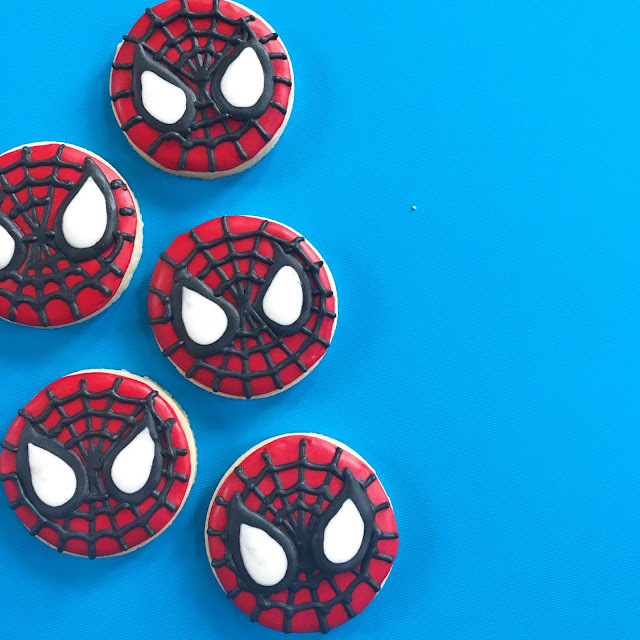 The first step in creating these fun Spiderman treats is to create a royal icing transfer of the eyes. 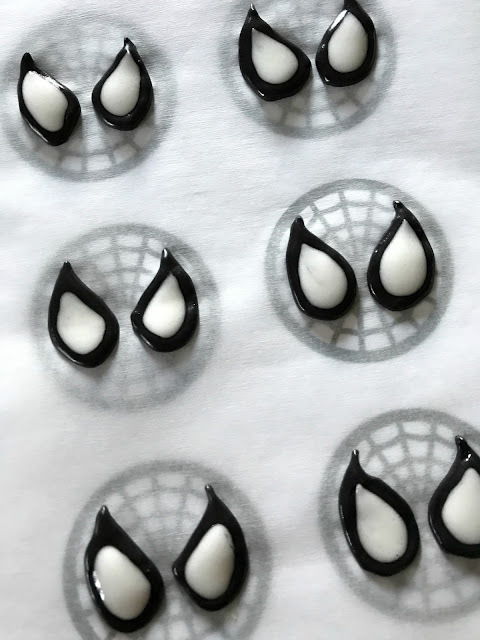 Search and print an image of Spiderman's face that you like. Make sure the eyes will fit on the cookie. Copy and paste several Spiderman heads on a piece of paper and print out. Place a sheet of parchment paper on top. You should be able to see through to the template quite easily. Trace the outline of the eyes in black and white. Your icing should be thin enough to flow, but not too loose. I think my icing was about a 15 second flood. Once you've iced all the eyes you need, do a few more! Sometimes these can be fragile and you'd rather have too many! Set aside to dry for 8-12 hours. They will pop right off! 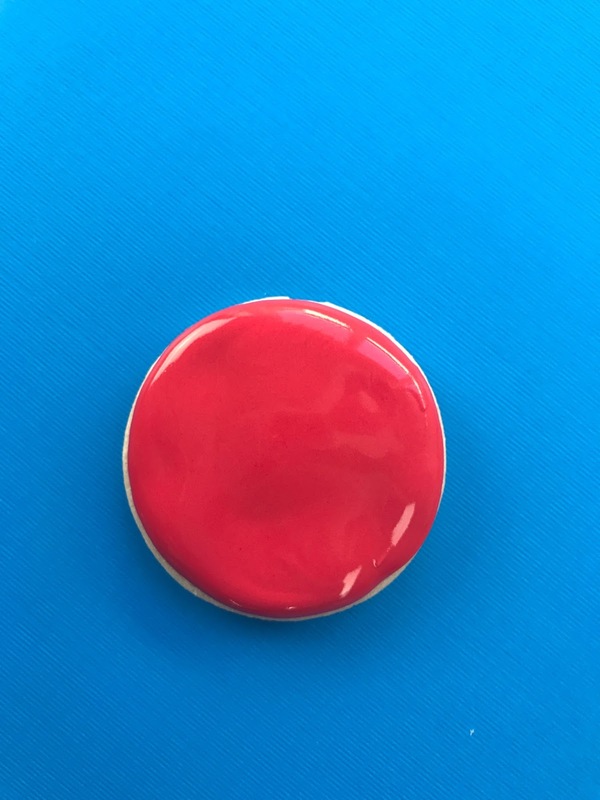 Now outline and flood your cookies in a bold red. I used Americolor's Super Red and love it! While the red icing base is still quite wet, gently place the eyes into position. 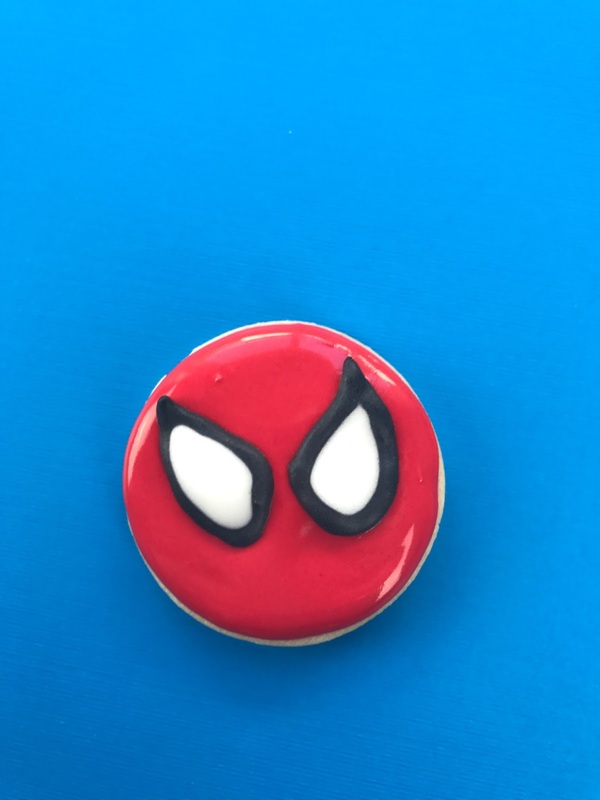 Since the icing is wet and you don't have the web piped, you can move the eyes as needed until it's perfect for you. Now you can either pipe the web while the cookie is wet or wait until it has crusted over. 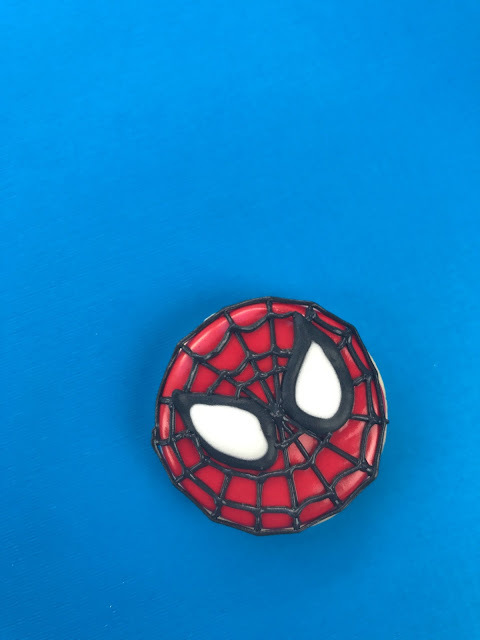 I piped mine while the Spiderman face was wet and didn't have any bleeding issues. First pipe the lines of the web, centered between his eyes. Come back and finish the web with cascading lines in a circular motion. Hi, Spiderman! You are all done. Wasn't that easy as pie? Your little Green Goblins will devour these in no time and will be off to fight crime ridden playgrounds. Do you need a royal icing recipe? Jump on over here to see the one I use every single week! Maybe your kids favor Batman? I have some cookies and cupcake toppers for the dark knight as well. Come watch the fun movie - just click the photo above to see me create the cookies. Wonder Woman is coming soon! These spiderman cookies will not be less than any treat for all the spider man lovers.I am in love with these cooking and going to present it to my bae. 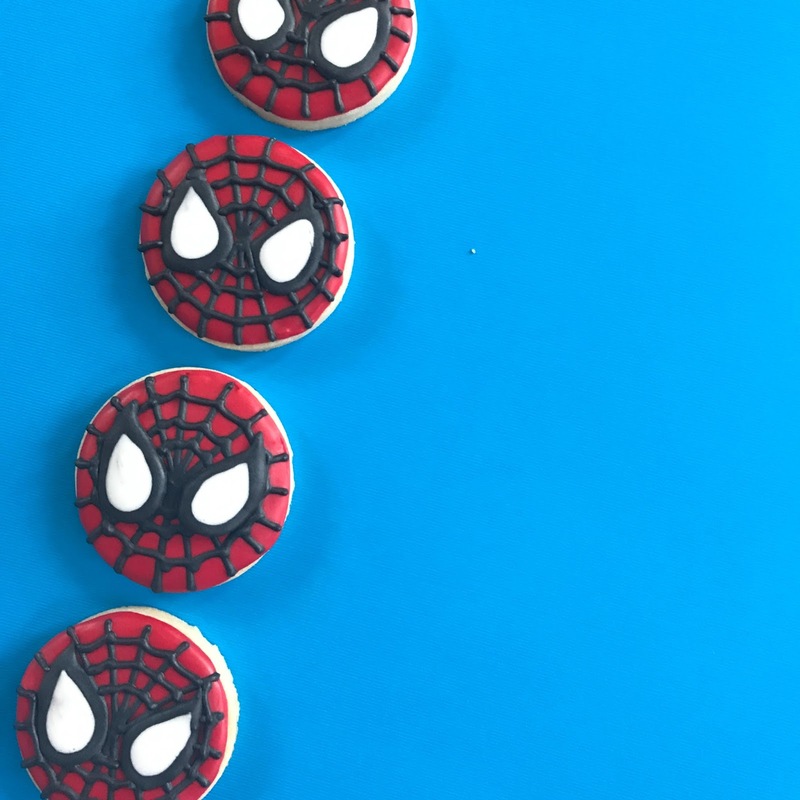 Aw~ These cookies are so adorable! My kids will love it! Thank you for the tutorial! Prices are reasonable, food is delicious, and wait staff is sweet, conscientious, and adorable. I came here for an event, got contained to upstairs. Service at event space NYC was prompt and food was awesome.